Want to see what we can do? You’ve come to the right place. Here you’ll find projects we’re working on and Land Cruisers we’ve restored and delivered to their new owners. From classic restorations to custom builds, every project and every owner is different. 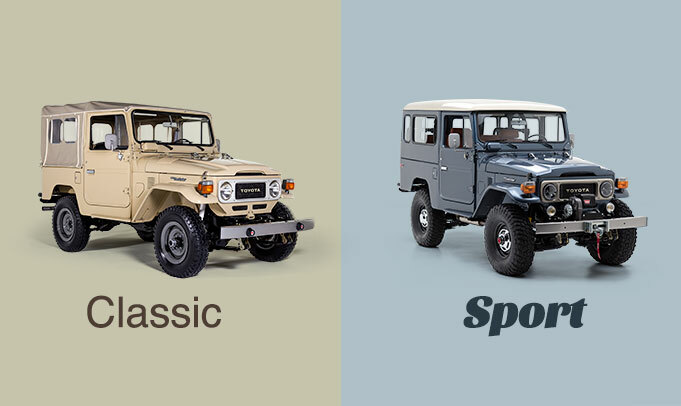 Just select a Land Cruiser to see its unique restoration story unfold, through photo galleries and video. See something you like? We’d be happy to recreate a past project for you — or you can pick-and-choose the features you like for something more custom. Go ahead. Challenge us. As long as your vision stays true to the authenticity and ruggedness of the Toyota Land Cruiser, we’re all-in. Build yours today or contact us.